Delightful. A child’s vision? Sometimes I think children should run the world. The haver well defined sense of right and wrong and esp of fairness which adults lack. Carl I think you are right – kids do know right and wrong, and all about fairness, plus it would be a lot simpler! How absolutely lovely, Claire. Thank you for an afternoon smile. My pleasure Msiky, an afternoon smile is a treat! Wonderful. I love sweet peas. We get them in the spring here. They are my favorite flower (and my Grandma’s). Thanks Sharyn, I think Fuscias are my favourite, but probably because they were my mum’s favourite – the scent of them just takes me right back to her. It’s amazing what memory triggers we have. I love sweet peas and they do smell so good! I love sweetpeas. When my daughter was small, it’s what I called her. Then, one day I hear her tell her cousin “my momm calls me a vegetable”. I explained that sweet peas are a pretty flower and she has loved them every since. I wonder why they don’t grow where you are Marie? I’m terribly lazy with them – chucking them in a pot or in the ground and then forgetting about them. Glad I didn’t forget too much about them though! There are few flowers that can fill a room with fragrance like these! Hi Lynda, they really do fill the room. A friend popped in tonight and she had a bunch of sweetpeas she had just picked and we left them in the hallway for half an hour, and the scent as you walked back was wonderful! I’ve never seen sweet peas growing in a garden but I can imagine the joy felt from seeing such a sight and the pride in having helped nature bring it to pass. 🙂 I especially liked the sweet peas and lavender in the vase. There is a joy to them, so thank you for that word! And the lavender was a bit of an accident, a happy one as it turned out! I meant to be cutting some of the lavender to dry but I keep forgetting! 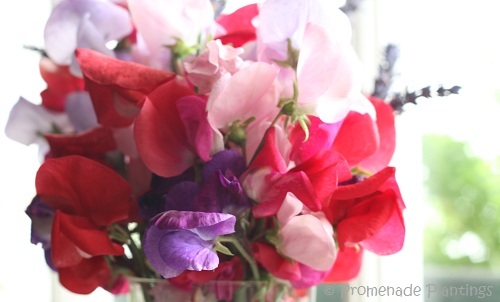 Beautiful poem and gorgeous photos… sweetpeas are just heavenly! 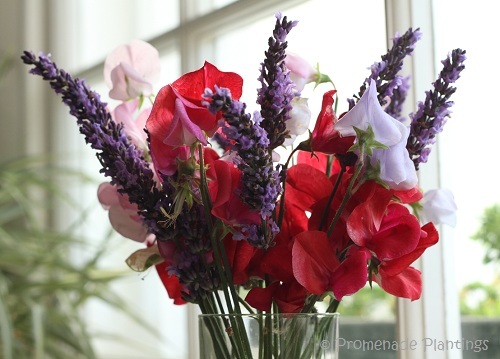 The post is as sweet as…Sweet Peas. The scent of childhood. 🙂 For me I think of English gardens and allotments when I see sweet peas, they just wouldn’t be the same without them! Beautiful post: in the words and pictures. And I agree with Carl’s comment above..
What a beautiful poem it’s the first time I’ve read it and I was really pleased to do so. The sweet pea look lovely. 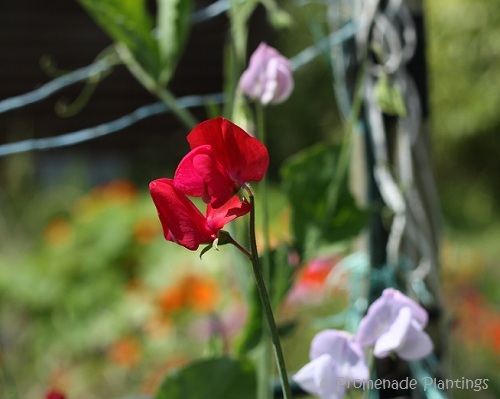 Thank you, I thought th epoem captured something special – childhood and sweet peas ! Sweet peas… I just adore them! They are so transient, as soon as you pick them they start to fade,but their perfume is sublime! It does, you have to keep picking them and the more you pick the more you get!!! What a sweet verse! I hadn’t heard it before. I have perennial sweet peas in a small bed. They are just as pretty as the annuals, but they don’t have the lovely scent. Thanks, Claire! The perennial ones are so pretty Cindy, smaller and more delicate. We used to have some in an an old garden that grew in the middle of the lawn every year, we never had the heart to mow them down! Sweet Peas are such a lovely and simple flower. Nice post. thanks a million for this poem, new to me and just divine! It’s sweet isn’t Christine, just like the flowers! Sweet peas are great, though this year I didn’t get around to sowing any of the annual varieties so I have to contend myself with the somewhat less scented perennial sweet peas that I have in several spots. Lovely that you have the preennial ones! These were a freebie from a magazine that I threw into pots at the last minute and luckily they came good. I think they are an old fashioned variety, very heavy scent and nice long stems. Oh.. of course I’m enchanted by this post, Claire!! Beautiful sweet peas.. a lovely poem!! I picked up a bunch of sweet peas at the market and love to smell their fragrance in my kitchen!! Did you grow these?? Incredible, they are perfect!! I love adding a few poems here and there into the blog, I know so many of you who write your own, I’m not clever enough for that, but I do have some books which I can dip into every now and then for inspiration. And how lovely you got some sweet peas at the market – I love carrying them home, the scent leads me on 🙂 And yes I grew them, and thank you Smidge for your kind words ! beautiful poem and enchanting photos. My sweet peas look so tiny and petite compared to yours! You must have different varities in England than I do in the States. I bet the smell just as wonderful though! I’m sure the smell is just as wonderful Julie. These ones were from a packet I got free with a magazine, they are an old English variety (if my memory serves me right) and are heavily perfumed and have long stems so they are perfect for picking and popping in a vase! How beautiful. It’s a great red. Thank you – the colours vary so much from deep reds to pale lilcas, none of them dull, all of them beautful. But I like the red ones too! I am very delighted to read ( and see ) this post. Those sweet peas are stunning! so so so pretty Claire! loved the rhyming verse, the images in my mind you helped create, and your flowers, so winged, light as air, and colored so…sweet! what a little treat of a post…thank you! Thank you for your kind words and exspecially your description “your flowers, so winged, light as air, and colored so…sweet!” I love the idea of them being winged and light as air, kind of dreamy in a beautiful way ! What a nice plant–I still think of your earlier pictures of the variety with the lovely flowers that also produces edible peas! Hi Inger, the Salmon flowered peas are so pretty aren’t they, but they don’t have the scent that these sweet ones do. Maybe someday a clever plants person will grow some that are! Beautiful, beautiful Sweet Peas! If you grew these beauties, which I am sure you did, you should receive a Gold Medal. It is so very hot here in the Southern USA that this year they had no chance! I will gaze at yours and enjoy the “sweet” poem. Thank you so much Teresa, and yes I did grow them, but I feel like a bit of a cheat as I really don’t do anything except chuck them in a pot and then transplant them later on. I think I have the English climate to thank for them 😉 Reading some of the comments it seems sweet peas are a Spring flower in california, and pretty much non existent in other parts of the country as it’s too cold. So difficult to find a balance. I just wish we had computers where you could “scratch and sniff” then I could share them properly ! Claire, I love this. I like thinking that I am still able to see through a child’s eyes and delighting in what I see. Ho wownderful Lulu that you can still see through a child’s eye – the excitement and wonder at life. That really is something precious! A really lovely poem, and such pretty blooms. Sadly sweet peas don’t do well here, drying up very quickly. But I love their fragrance. It sounds like sweet peas are more fickle than I had realised, and now I realise that I take them for granted, that they are part of the furniture of the allotment! Great photos! 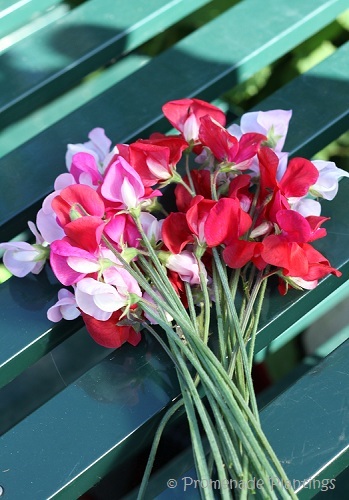 You’ve inspired us to plant more peas with different color flowers next year! Thank you, and that’s fabulous that I’ve encouraged you to try some new colours! Mind you I’ve bought some seeds from a posh shop for next year – all the same colour, I may have to re-think this one!! A sweet summer post Claire! I thought I could faintly detect the ethereal scent of the sweet peas when reading the delightful poem and soaking in the brightly colored images, a gem! Thank you for your kind words Deb. A gem indeed ! My favorite flower! You are lucky too be able to grow them in August, in the southern US, we only get a few short weeks of bloom in early spring! Hi there, it seems this year is a good one for sweet peas, my fellow gardeners also are picking beautiful bunches. I hadn’t relaised what a short season you guys have – fleeting but beautiful ! We should have smello-vision Kathryn, then you really could enjoy the heady scent, they seem to be producing lots and I picked another pretty bouquet again today 🙂 Happy days ! Beautiful illustration of a lovely verse. I wish there was a “Love” button instead of a “Like” button! 🙂 Lik ejust doesn’t do somethings justice does it, it’s like saying someone is nice!